Welcome to this years programme! 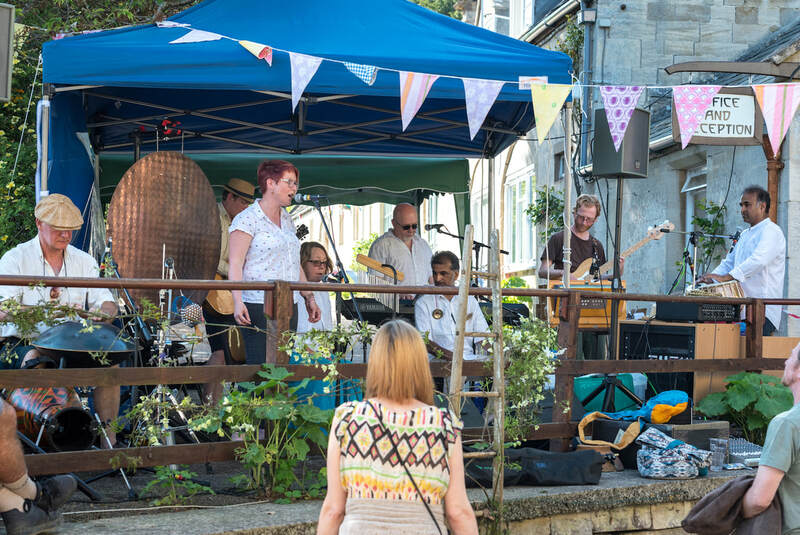 Promoting a message of unity and peace, we have an exciting and diverse line-up, with family friendly events and activities happening throughout Stroud town centre. To help make the festival as inclusive as possible this year, we have decided to do away with tickets and request that admission is by donation only of a suggest amount between £10 and £50 one donation can cover all festival events, pay as you can afford to help fund all these wonderful musicians and workshops. 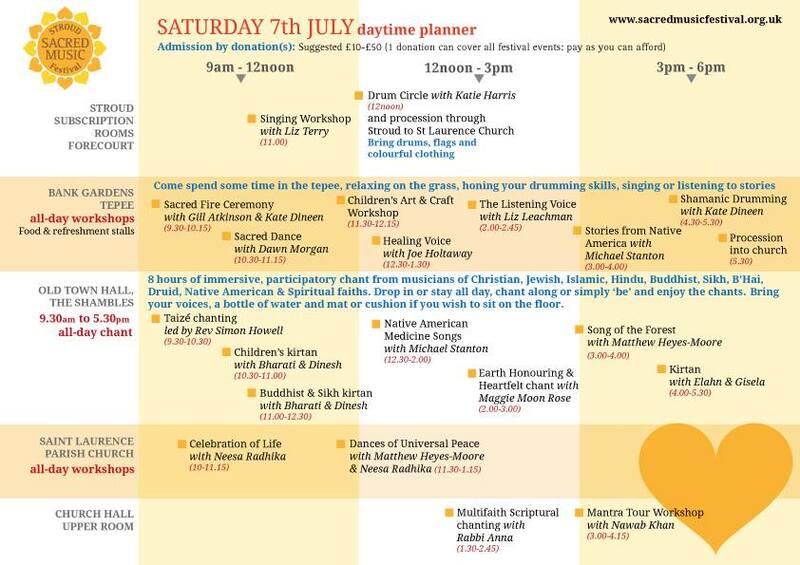 The Stroud Sacred Music Festival is a non-profit event managed by volunteers for the wider community, all the events and performances are paid for solely by donations and fundraising. New for this year, the Friday evening event will be a young adults takeover with an emphasis on inclusivity, fun, expression, music, creatively, and spiritually. Come along if you're young of age or heart, and willing to try yoga in the dark. The event which is focused towards the mid-teen to mid-twenties age bracket, will be held by responsible adults, and will be alcohol free. Under 16's will need to be accompanied by a responsible adult & all adults will need to be accompanied by a responsible teen. Come spend some time in the tepee or relaxing on the grass, honing your drumming skills, singing or listening to stories. Eight hours of immersive, participatory chant from musicians of Christian, Jewish, Islamic, Hindu, Buddhist, Sikh, B'Hai, Druid, Native American & Spiritual faiths. Drop in or stay all day, chant along or simply be and enjoy. Following on from the days proceedings, a selection of the musicians will begin the evenings events with an original piece of unifying chant composed especially for the festival by Matthew Heyse-Moore. Later on we'll be treated to a divine performance by Sridhar; master of the sarod, a traditional raga instrument, followed by the ethereal sounds of South West based folk musicians Faeland. For classical fans there will be the Mosaic Pan Orthodox Christian Fellowship Youth Choir, and specially composed Organ interludes by film composer and orchestrator Adam Langston, allowing people to explore the Church space and its wonderful acoustics, grab a bite to eat or sit in contemplation enveloped by the sound. We are delighted to announce the enchanting Syrian qanun virtuoso Maya Youssef and her trio will be headlining. Bringing the festival to its conclusion will be the Stroud Sacred Music Festival house band the Ragababas joined by friends to close the evenings events with chant followed by contemplative meditation. All evening there will be vast selection of delicious vegetarian & vegan food along with chai, tea, coffee, soft drinks, mock-tails, sweets, chocolates and cakes available to purchase. Visit the Razzmatazz stall and check out the vintage clothing available to spruce up your festival wardrobe, proceeds going towards Refugee Aid Stroud.